Nothing could be further from the truth. America is more “small town” than we often think, particularly in how we govern ourselves. In 2000, slightly more than one-half of the nation’s population lived in jurisdictions --- cities, towns, boroughs, villages and townships --- with fewer than 25,000 people or in rural areas. Planners and geographers might see regions as mega-units, but in fact, they are usually composed of many small towns and a far smaller number of larger cities. Indeed, among the metropolitan areas with more than one million residents in 2000, the average sized city, town, borough, village or township had a population of little more than 20,000. Although local government consolidation and regional governance is all the rage in policy circles, most Americans seem content with a diverse, even fractured governmental structure. According to the 2002 U.S. Census of Governments, there were more than 34,000 local general-purpose governments with less than 25,000 residents and 31,000 local general-purpose governments with less than 10,000 residents (accounting, with rural areas, for 38 percent of the nation’s 2000 population). With so many “small towns,” the average local jurisdiction population in the United States is 6,200. Even in big metropolitan areas, citizens are often governed by small local institutions. People in Brecksville, Ohio (population 13,000), may tell their friends from far away that they live in Cleveland and residents of Woodway, Wash. (population 1,000), may claim to live in Seattle. But in reality their local governments are located not in the great City Hall downtown but in a usually quite modest nearby building. This large number of governments horrifies some organizations and people. Planners, the media and many often well-meaning local activists argue that local governments should be consolidated to eliminate waste and duplication. And so, in recent years there have been strong initiatives to force local government consolidations. Bigger, the argument goes, is usually better and more efficient --- and certainly easier to cover if you are a journalist and influence if you are a big business interest. Pennsylvania and New York recently started initiatives to consolidate their governmental structure. They took to heart the usual mantra that there are thousands of governments in the state and that they must be consolidated to save money. In both states, the efforts were clothed in promises that local government consolidation would improve competitiveness relative to other states. However, the proponents never bothered to look at the data. We did and the results were stunning. In both states, an equivalent “market basket” of spending was compared. In Pennsylvania, the largest local jurisdictions spent (including a per capita allocation of county expenditures, so that Philadelphia could be included. Social service spending was excluded) 150 percent more per capita than jurisdictions with between 5,000 and 10,000 population. The largest jurisdictions --- those over 250,000 people --- spent 200 percent more than jurisdictions with under 2,500 residents. Moreover, it is not a matter of urban versus rural. In both the Philadelphia and Pittsburgh areas, there are literally hundreds of suburban jurisdictions that spent at less than one-half the per capita rate of the central cities. The story was little different in New York. The largest jurisdictions (those over 100,000) spent nearly double per capita as jurisdictions with between 5,000 and 10,000 population (this would have been even greater if it had been possible to include New York City). The big governments spent even more (more than 150 percent) compared to jurisdictions with between 1,000 and 2,500 population. The differences were even greater within metropolitan areas, where smaller jurisdictions were even more efficient relative to the largest jurisdictions. Why should this be? Perhaps it’s the old, all too often neglected Jeffersonian principle of downscaling government closer to the people. Elected officials who know more of their constituents are likely to be more responsive to their needs. Too often the principal economies of scale that occur from municipal consolidations are economies of scale for lobbyists and special interests. Further, this small town governance structure is not limited to the United States. Metropolitan Paris has approximately 1,300 general-purpose local jurisdictions, more than any U.S. metropolitan area. Milan has more than 600. By comparison, Tokyo-Yokohama, the world’s largest metropolitan area, is a model of government consolidation, with more than 200 general-purpose governments. America’s small town government structure engenders a sense of community, even as a part of larger metropolitan areas. They also save a lot of money, principally because democracy tends to work better when government is closer to home. It is not surprising that so many consolidation proposals fail and that when given the chance, voters usually reject consolidation proposals. America needs both its small towns and its bigger cities. But make no mistake about it, even much of what we call a “metropolis” functions more effectively as a network of small towns. 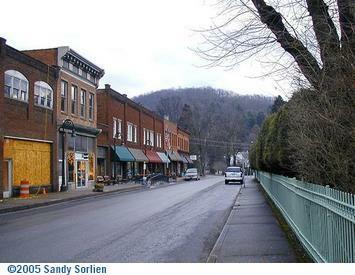 The view of Main Street, Bramwell, West Virginia was photographed by Sandy Sorlien as part of her twenty-year project, The Heart of Town: Main Streets in America. New Geography apologizes for having initially published the image without permission or attribution.